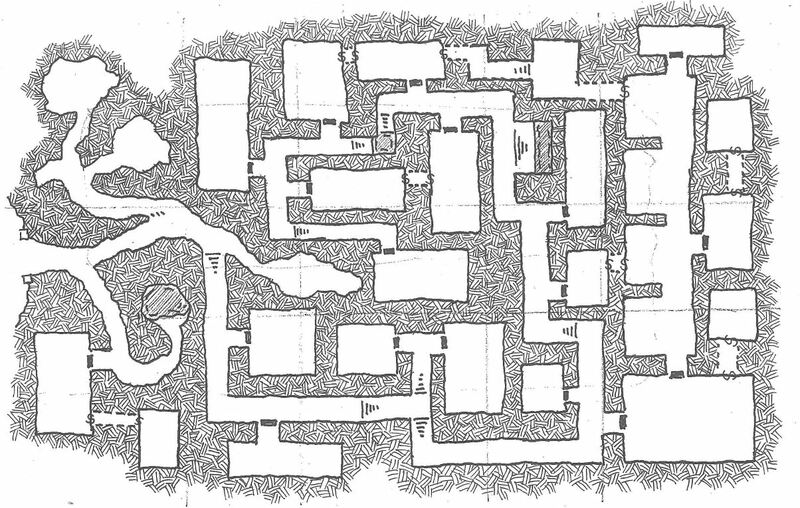 Here’s an old school kind of map for any sort of impromptu weekend dungeoneering hijinks you might need a map for. 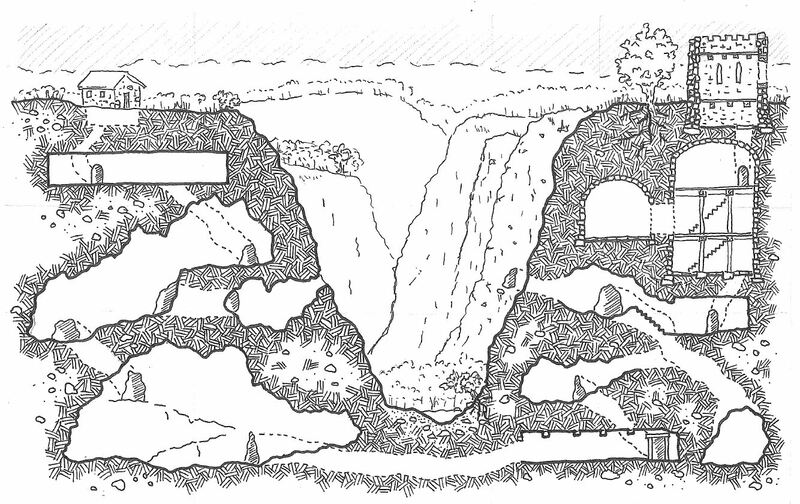 This is a mid-level dungeon, with stairs leading down from above (near the waterfall pool, lower left) and further into the depths (flanking the waterfall at the end of the stream, lower right). Overall, this is far from a beautiful map, and it was done as just a fast throwaway, but there are a couple interesting bits you might like to use in maps of your own. The watercourse is kinda interesting, but doesn’t quite work. Since this was scanned in color – to get the blue of the water to show – I had expected that the grid might show up, as well. It’s interesting that it didn’t show up in the scan, but the phonecam sees it just fine. Merry New Year, all! I’ll try to have something good queued up for Friday, again. Some of the side passages and service areas for the larger complex known as the Crypt of the Tetris-Lords (which is largely in the areas following the wider hallways off to the top and right from this section). Entrance is from the passageway coming in at the bottom. An early WIP post of this was jokingly titled “Crypt of the Tetris-Lords,” so I’ll stick with that. The image was scanned extra light in order to minimize the layout grid. I suppose it could be nice to keep the squares for counting out distances, but it reads really nicely without them, too. And, if you want to actually use this for a game, I think it’s tetris-y enough you can figure out most distances and dimensions pretty readily. After posting the last map in this style, I learned that it is also referred to as “military projection.” It’s probably more correct to call this oblique projection (and you can make an accurate flat map from this by tracing the walls and edges). 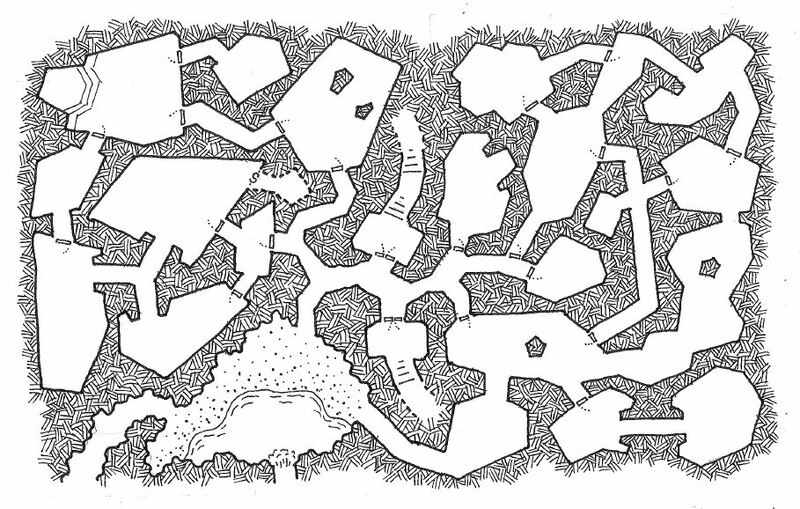 It is said that there are seven levels to the underground complex known as the Drevansic Warrens, but those are only tales from an earlier time. Clethus Strongbow reported that he had been to three levels, and then never returned while exploring for a fourth. A weird, twisting mess of odd shaped rooms and bending hallways. This is principally an intermediate level, to be used with a larger complex, with stairs leading both up and down. If you’re an Antherwyck House Games Newsletter subscriber, there’s a new one winging its way to your inbox. Here’s one of the kinds of things I loved coming across in books when I was a kid. 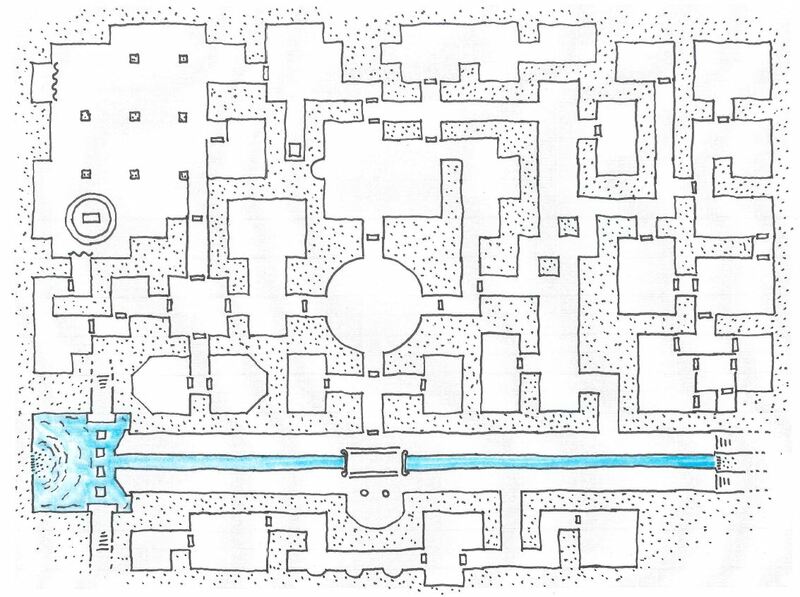 This is probably a part of why I love drawing dungeons like I do, and that’s why I’m sharing it here. I think this is a great resource. The full size plate is a thing of beauty. This came from the Gutenberg project, so it is a work in the public domain, and I’m happy to see it shared widely. Already, this has figured into a couple of the maps I’ve posted (whether to good effect or not is a separate question), and I hope to do more from this chart (maybe eventually at least one of each, but there are no promises about that). 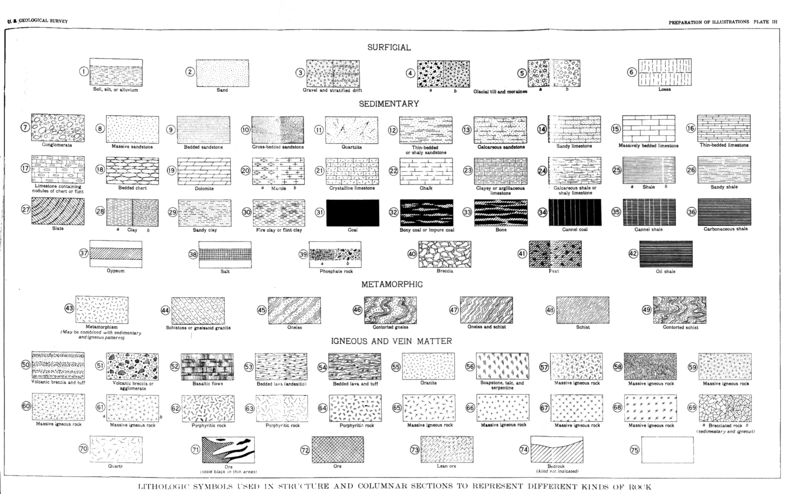 For reference, the kind of hatch that I do most often (and that Dyson Logos popularized) is #58, “Massive igneous rock,” but there are clearly other choices available, if you’re open to mixing it up a bit. The Pit of Creasfryb first appears to be a carved stone archway in a cliff face that frames a natural cave. There are a couple of branches that slope off from the main passage, but then there is a hallway and descending stairs that are clearly not naturally formed. This becomes a series of hallways and rooms that wind their way deep into the earth. It is a damp place, with dripping ceilings and wet floors and walls, to the extent that water is running along the floor as one proceeds deeper into the Pit, and there is a catch bay (with the wide stairway down to a pool that catches much of the runoff, and then a sump in the main passageway (with stairs leading down to another pool and then back up on the other side) to help keep water out of the lowest reaches. This was another dungeon that worked out as a spiral, generally. But, unlike a some others, there are a couple of opportunities (if you find the secret doors) to follow an alternate path through it. Another thing that was important for me in this was to keep the levels straight, so things that are reached by different means are all on the same level, after you’ve gone up or down the different flights of stairs (though there’s one error on that front). The whole thing has a downward spiral going on, as well, as it winds to the center. This is an older (-ish, for values of old along the period I’ve been posting these maps) map, with a crappy scan and some of the guide lines showing up. But despite that, it’s still readable enough to be worth sharing. As usual, feel free to use for any non-commercial purpose, or contact me if you’d like to use this in a commercial fashion. 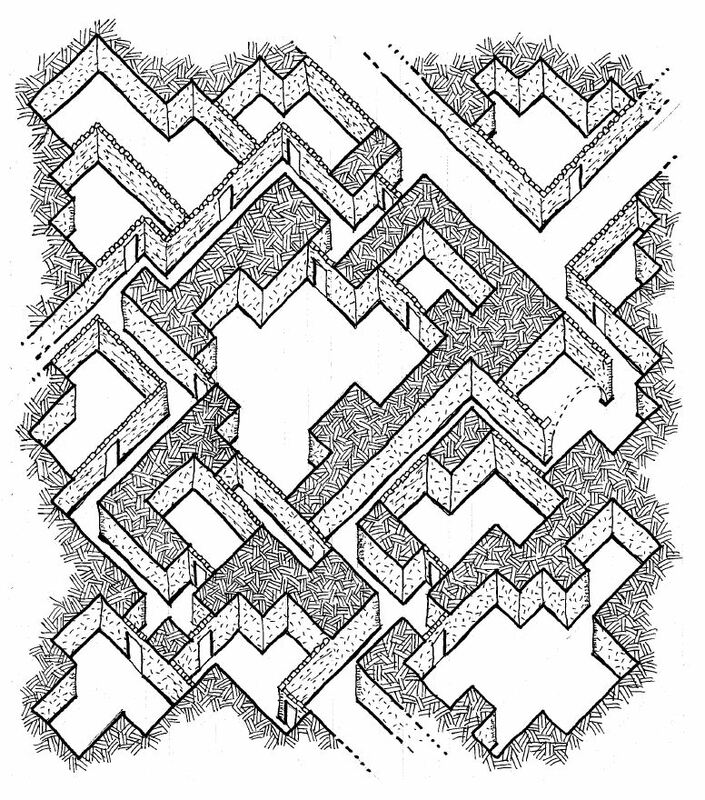 An underground complex of 15 rooms, with a central hallway connection. Stairs shown at the bottom of the map lead up to the main Fortress Sakkiz-Kamar. 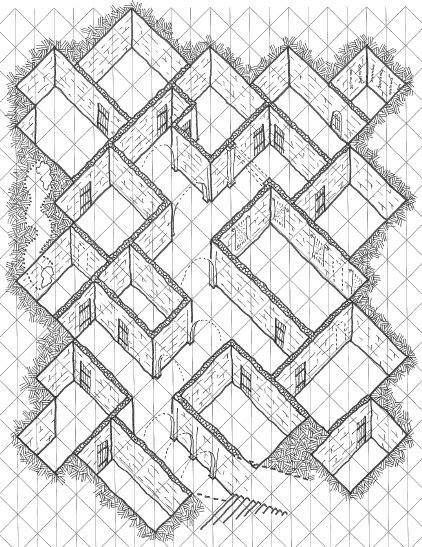 This is an axonometric projection, so all the rooms are the proper size and orientation to one another. It’s similar to isometric, but here, the walls that should be 90 degrees to one another are 90 degrees, so you can rotate this halfway and look at it as a plan view. Distances between places can be measured accurately (as long as you are measuring parallel to the ground plane). It’s less convoluted than some other dungeons, but in this experiment, I wanted to be sure it would be very readable. I haven’t really taken full advantage of having the walls show, other than in a couple of rooms (the Large Hall in the middle and the Holding Cell at the far end, as well as a few archways in the corridor), but this is a nice way to show a dungeon, and I will probably do more along these lines. Next time I do one of these, I should make sure to make the vertical lines non-reproducible; it’ll read much better that way. A deep valley with a small keep on one side and a stone hut on the other. But what is interesting is all that lies beneath the surface. This turned out rather better than I had expected. Putting the valley in the middle seems to have helped get it into manageable pieces and break things up. Tree roots were only penciled in to start, and then, when overtaken by hatch, I figured they’d just be gone. But I tried with the heavy pen, and that seems to be even better than the original; I’m really happy with that bit. Unfortunately, the little tree by the stream kind of disappears. The background could use some help, but it’s workable enough for present purposes.